Unlike most water turbines, which have axial or radial flows, in a cross-flow turbine the water passes through the turbine transversely, or across the turbine blades. As with a water wheel, the water is admitted at the turbine's edge. After passing the runner, it leaves on the opposite side. Going through the runner twice provides additional efficiency. When the water leaves the runner, it also helps clean the runner of small debris and pollution. 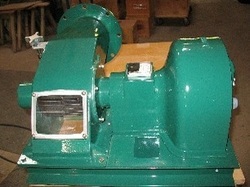 The cross-flow turbine is a low speed machine that is well suited for locations with a low head but high flow. 100% stainless steel and cast aluminum! 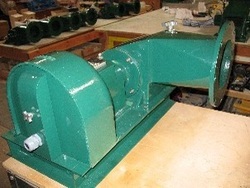 Over a range of flows the average efficiency is 80% and may be as high as 85% running at the design flow and head. Control of flow is controlled by a guide vane and this allows flow capacity to be varied for optimal efficiency and reliability. Screened intake to prevent fish, leaves, and rocks from entering system. Unit is rated at 1500 watts @ 15 psi using 520 gpm, 130 volts AC +/- output rectified to DC for charge controller, for battery application, or grid connection. Generator is capable of up to 2000 watts. These figures will vary according to each installation. The runner is made from 300 series stainless steel. 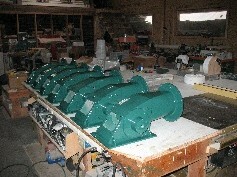 The housing is heat treated cast aluminum and finished with a powder coat. Well suited for unattended electricity production. Two year warranty, even though machine is designed to work for at least 20 years with maintenance free! Idaho residents please choose shipping with Idaho Sales tax added on the Authorize.Net payment form (check out) or your order will not be processed. Please call!